This is the culmination of what began on October 6, 2013, at 8:12 a.m. It was to be The Blue Book: The Ultimate Project. In increasing clarity, these books show first the preparation and then the arrival in the first book—which, I freely admit, is not easy to read. But any change that I made, made it nearly impossible to continue until I reversed the change that I had made. It was realised that things had to be effectively translated. This is what led to the creation of The Red Book. So using what I had learned and figured out, I applied the same technique to a digital camera, and the results speak for themselves. 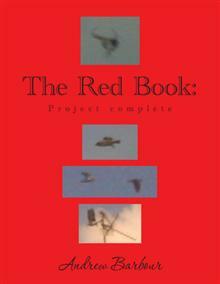 Accepting the impossible or impossible to accept The Red Book; Project Complete is the second part of the Extra Terrestrial Disclosure Project, beginning with the hard to read and hard to grasp Blue Book; The Ultimate Project and an attempt to disclose the presence of other races along side humanity on this planet. What began initially as a translation of The Blue Book it soon became apparent the two books were connected in ways I could never of expected, but leading to the most basic understanding, The Blue Book set the stage and The Red Book introduces the players in a purely visual manner. Impossible, not in this life time, it will never happen, are you wearing a tin foil hat? and the implication that I was regarded as being to ignorant and uneducated for this to of happened to. All this and more from the people who all professed to have a desire to help and understand in these matters, and it struck me, how many more people have had an experience that left them feeling vilified,ridiculed and mouths forced shut by the pressure to conform? The Red Book:Project Complete in part attempts to correct some of this by revealing that there is an Extra Terrestrial presence that is far beyond what we are told and forced to accept. Not to cause panic,or alarm, just to inform. We know there are creatures living at the bottom of the deepest oceans and in the darkest jungles that we know nothing about except for an image. Why? Because there was a photograph taken by an explorer who belived he could find it and take a photograph but all we know is what it looks like. Not knowing what it is, where it is from?, where it is going?, what does it want? will it accept a friend request on Facebook? Never finding the answers to these questions does not change the fact that the creature simply exists. The Red Book attempts to work on the same principle but takes it a stage further as a basic visual language, not in the ocean or jungle but in the skies. The use of intuition is a useful ability when viewing The Red Book, to think outside the box and put the pieces together into a form that can be understood by the reader, falls to the reader, but I can open the door. I will state is that none of the obviously apparent and visible bird forms were physically seen. As well as some forms that I am glad I did not see physically. Just realising that the objects are there, then question where object appears to be, on the roof, on the ariel, in the sky or in the cloud cover, even to the point of what is it? and what shape is it? in some cases. One easy leading question is this, if something that appears to have a bird form has just left distant cloud cover or a dark object can be seen in the distant cloud cover, far beyond the range of a camera for it to of been in any way a bird,and just how large would that object or bird form have to be to be photographed at such a distance. This is what the attempt to convay is in the first five images in The Red Book, page 1 just the cloud, page 2 the bird form, to continue the bird forms implied, which started at the end of The Blue Book; The Ultimate Project. Page 3 just the cloud, page 4 has the image of a creature that looks more like a yellow penguin with arms,not wings, page 5 the anomalous object in the cloud, as if to attempting to suggest something has travelled in a circular pattern to try and establish the concept that what is being seen is outside the realm of the known.In essence an attempt at a basic form of visual communication. As a further attempt to imply this, page 12, one hour 54 minutes after the first unknown apparent creature there is two more apparent creatures with one of them looking more like a giant fish than a bird and these were definitly not seen despite their apparent size and location. These and other images through out the Red Book attempt to keep the readers mind frame focused on the unknown, to think outside the box. The timed sequences in The Red Book: Project Complete, which are 3 seconds apart, also appear to demonstrate that some of these have the ability to change their form and size in relation to need and proximity, pages 86 and 87 attempts to demonstrate this, what could be the same object going from an apparent bird form to something that appearing to be an shape that was unseen,attached to the side of the chimney like a form of limpet, this is not the only example of this, page 151 appears to be just a bird on the ariel but in 152 there appears to be something attached to the side of the ariel that looks nothing resembling the bird seen on the previous page. Within The Red Book there are hints that what is in the pages are not birds but bird forms, another example of this is the sequence for pages 199 and 200. Page 199 appears to just show what appears to be two birds but page 200 shows another apparent larger creature that appears to be following them, if these are birds why is the other apparent creature following them? The size of some of these objects in the most part is impossible to judge but there are several attempts to demonstrate to this, one in particular is page 175 what could be seen as just an insect, but on closer scrutiny looks to give the impression like an insect, appearing to have similarities to the apparent creature on page 5, this appears to be in the gap in the cloud cover very high and very large. Another attempts at suggesting the size of some of the anomalous objects are on page 194, a large object that appears to be exiting the distant cloud cover and page 236 another insect type form just beneath the cloud cover. The final part on the apparent size and shape of some of these objects is exemplfied on page 249, a black object just in front of the tv ariel looking like a jigsaw piece with a dark red line across it,to an object that is apparently entering the cloud cover in a different form on page 250 in the final image and drawing to a close to the Red Book; Project Complete. To borrow a well used blanket phrase used by individuals who profess to be involved in contact and investigation in these matters,’ When you are dealing with these beings, you just know’. I found that this is the case, but in the pages of the Red Book; Project Complete is the oppertunity for the reader to discover this for themselves.